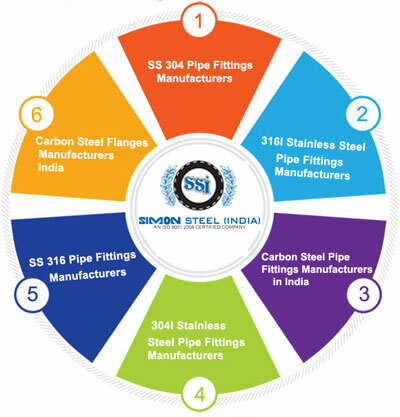 Simon Steel India is an ISO 9001:2008 certified supplier and exporter of mils steel and carbon steel flanges in Visakhapatnam. ASTM A105/105N and IS 2062 grade carbon steel flanges are manufactured as per ASME B16.5 150#, 300#, 600#, 900#, 1500#, 2500# | BS EN1092-1 PN 10/16/25/40 | BS 10 Table D, E. All raw materials purchased by Simon Steel India to manufacture mild or carbon steel fittings and flanges are fully traceable to mill source or relevant specifications. All carbon steel flanges are manufactured in India, with raw materials coming from reputed Indian and Overseas Mills. We are a specialist supplier of large diameter and small diameter carbon steel and mild steel flanges in Visakhapatnam. We can offer destructive and non-destructive test reports for all the materials. Our stock and supply range for ASTM 105 carbon steel flanges in Visakhapatnam is from 1/2″ NB to 24″ NB, and we can manufacture and supply up to 36″ NB mild steel flanges and higher sizes too as per international standards. We offer ASTM A105 carbon steel flanges in Visakhapatnam with face finishes to suit Raised Face, Flat Face and RTJ and can machine other face finishes upon request. Mild steel and carbon steel buttweld fittings can be offered in a size range of 1/4″ to 48″. Most of the sizes are available Ex-Stock for immediate supply to our customers in Visakhapatnam. We are able to manufacture Orifice Weld Neck ASTM A105 Carbon Steel Flanges, Drip Rings, Spectacle Blinds Carbon Steel Flanges and Special Flanges in Visakhapatnam made to match customer specific requirements. An ISO 9001:2008 Certified Company, Simon Steel India is a prominent manufacturer and supplier of stainless steel flanges in Visakhapatnam. Our products are manufactured in accordance with custom drawings, as well as in accordance with ANSI, ASEM, DIN, BS standards. For our customers in Visakhapatnam, we can offer a complete range of both small and large diameter size stainless steel flanges, combined with a full line of pressure classes. Stainless Steel Flanges Suppliers in Visakhapatnam, Flanges Manufacturers in Visakhapatnam - AISI 304, 304L, 316L, Duplex, 321, 347. Simon Steel India is an ISO 9001:2008 certified supplier and exporter of stainless steel flanges in Visakhapatnam. ASTM A182 stainless steel flanges are manufactured as per ASME B16.5 150#, 300#, 600#, 900#, 1500#, 2500# | BS EN1092-1 PN 10/16/25/40 | BS 10 Table D, E. All raw materials purchased by Simon Steel India to manufacture ASTM A182 stainless steel flanges are fully traceable to mill source or relevant specifications. All stainless steel flanges are manufactured in India, with raw materials coming from reputed Indian and Overseas Mills. We are a specialist supplier of large diameter and small diameter stainless steel flanges in Visakhapatnam.We can offer destructive and non-destructive test reports for all the materials. Our stock and supply range for ASTM A182 stainless steel flanges in Visakhapatnam is from 1/2″ NB to 24″ NB, and we can manuafcture and supply up to 36″ NB stainless steel flanges and higher sizes too as per international standards. We offer ASTM A182 stainless steel flanges in Visakhapatnam with face finishes to suit Raised Face, Flat Face and RTJ and can machine other face finishes upon request. We are able to manufacture Orifice Weld Neck ASTM A182 Stainless Steel Flanges, Drip Rings, Spectacle Blinds Stainless Steel Flanges and Special Flanges in Visakhapatnam made to match customer specific requirements. Stainless Steel Pipe Fittings Manufacturers in Visakhapatnam, Stainless Steel Tube Fittings in Visakhapatnam Suppliers BUY NOWAn ISO 9001:2008 Certified Company, Simon Steel India (Pipe Fittings and Flanges Division) is one of the most trusted and high quality manufacturer and supplier of stainless steel pipe fittings in Visakhapatnam. We can manufacture stainless steel fittings in Visakhapatnam in size range of 1/2 inch NB or OD up to 48 inch, with varied thickness. Our stainless steel fitting products are supplied to our customers in Visakhapatnam, with complete certification, heat marking and test reports. To meet the most demanding requirements for various projects in Visakhapatnam, we can offer Chemical and Physical Test Reports from NABL Approved Lab which is widely accepted by Government Companies in India. Our key products supplied in Visakhapatnam include stainless steel reducer, stainless steel tee, stainless steel elbows, stainless steel end caps in all major stainless steel grades. Stainless Steel Buttweld Fittings Manufacturer, Supplier Exporter in Visakhapatnam – 1/2″ NB to 48″ NB in thickness of SCH 5, SCH 10, SCH 40, SCH 80, SCH XS, SCH XXS up to 40mm. Stainless Steel Sanitary Fittings, Dairy Fittings and Pharma Fittings Manufacturer, Exporter and Supplier in Visakhapatnam. Pipe Fittings Suppliers in Visakhapatnam,Pipe Fittings Manufacturers in Visakhapatnam,SS Pipe Fittings Suppliers in Visakhapatnam,MS Pipe Fittings Supplier in Visakhapatnam,carbon steel pipe fittings price,carbon steel pipe fittings price List,Stainless Steel Pipe fittings exporter in India,ASTM A403 Stainless steel 317L Pipe Fittings,Stainless Steel Pipe fittings with Test Certificate, Stainless Steel Pipe fittings at dealer price,Carbon Steel Pipe fittings exporter in India,Stainless Steel Flanges exporter in India,Carbon Steel Flanges exporter in India,Carbon Steel Plate Flanges at dealer.